We have within us a being which I call the spirit – the spirit, which is also part and parcel of the totality that is love, totality that is God, totality that is joy, totality that is knowledge. And that spirit within us is watching us. It is not watching like a guard or a police inspector. That also, we human beings cannot understand…. The spirit is the one that is love. Can you understand total love? Can you understand something that just gives and enjoys giving and not asking for anything? Can you understand someone like that? Can you? Loving for love’s sake, that’s what is your spirit. It is watching you with that love, that total love. That totality of love is watching you to give you that what it is. Now here, I would say you are the spirit and you are this Self. Another one, which is this awareness, is this human awareness which you have got. 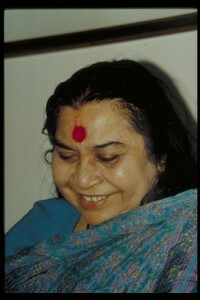 This human awareness has to be enlightened by that totality, that spirit. When it enlightens that, then only, you know that you are a part and parcel of the totality and that you are beautiful, you are really beautiful. There’s some times one feels a little bashful to know how beautiful one is and so fragrant and so grand and so dignified. That new dimension one has to understand…. To understand the totality of love, total love, you have to know that these are all just flecks. The ocean, the oceans of oceans of love will wash off these specks in no time, but have faith in yourself, that’s all. Have faith in yourself. After all, you are human beings.